CIVIL SERVICE STROLLERS have enjoyed a burgeoning rise since joining the Lowland League at the beginning of the 2016/17 season and remain on course to record their highest ever finish this term. A resounding 4-1 win over Vale of Leithen in the Borders in the only league fixture to take place last weekend lifted the Muirhouse club back up into fourth spot in the table. However, one thing that still eludes them is a first victory over tomorrow’s visitors to Christie Gillies Park, Stirling University. Having lost all five of their previous encounters against the Students, Gary Jardine’s side will aim to make it sixth time lucky as they look to maintain their sparkling run of form in front of goal. Midfielder Scott Clapperton, pictured, has contributed a significant part in Civil’s recent scoring spree of 14 in their past four matches after ending his lengthy goal drought. And the 29-year-old, who counts spells at Edinburgh City and Spartans among former clubs, is hopeful they can continue in a similar vein for the remainder of the campaign. “I don’t think I’d scored in about four years and then two come around in two weeks which is a bit of a strange one but I’m just happy to help the team out,” joked Clapperton, who netted in the recent victories over Dalbeattie and Vale over the past fortnight. “We’re not getting too far ahead of ourselves and know we’re in for another tough challenge against Stirling Uni on Saturday. We’ve not had a good record against them in previous years, I still don’t think we’ve actually managed to beat them yet. I’m not too sure why that is the case, but they’ve been a bogey team for us. 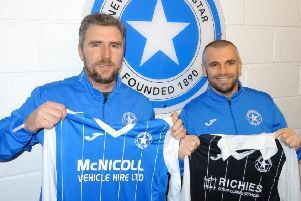 “They had a good result against Lothian Thistle in the cup last weekend and should probably be a bit higher in the league than they are, so we’re well aware it’s going to be another difficult game. “Our goal at the start of the season was to improve on what we achieved last year, and we’ve done that in terms of our points total, but we’re not looking any further ahead than cementing a top-six finish just now. “We don’t have one player running away with the top scorer charts, we’ve got a spread of goals coming from all areas of the park, which is great to see. Elsewhere this weekend, Spartans entertain third-placed Kelty Hearts at Ainslie Park tonight in a crucial game for both teams. Dougie Samuel’s men will look to build on their three-match winning streak, an opportunity they were denied achieving last Saturday after their clash with Dalbeattie was postponed at half-time due to an unsafe playing surface following persistent rainfall. Bottom club Whitehill Welfare must salvage maximum points from their lengthy trip to fellow strugglers Gretna 2008 if they are to retain any hope of avoiding relegation, while Edinburgh University face Cumbernauld Colts at Broadwood Stadium. The draw for the first round of the League Cup was made earlier this week with Civil Service Strollers and Spartans both handed home ties. Full draw (ties to be played on April 27): Civil Service Strollers v East Stirlingshire; Spartans v Kelty Hearts; BSC Glasgow v Whitehill Welfare; Vale of Leithen Vs Edinburgh University.